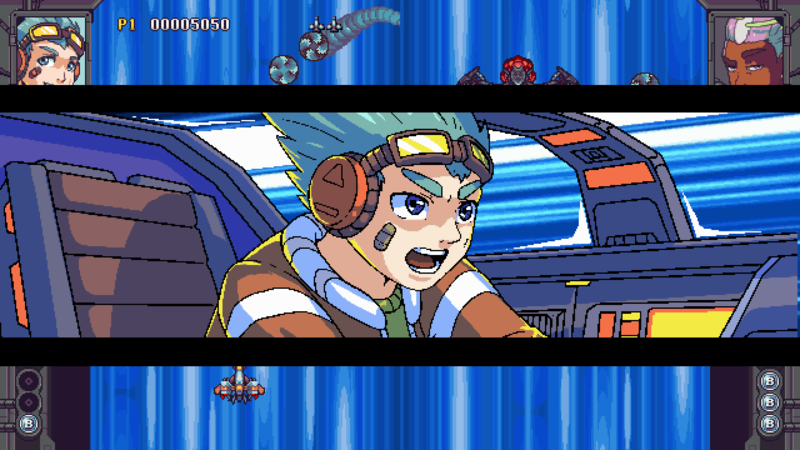 Rival Megagun is a nice love letter to old school arcade shooters but with a competitive twist. You are actually fighting another player! If you have ever played Twinkle Star Sprites, then you will have an idea on how this game works as it’s very similar. So much so, that it wouldn’t surprise me if that game was what inspired the designers to make this in the first place. The arcade mode is the main single player component where you will play a series of rounds meant to tell each character’s story. it’s really nothing too memorable since the focus here is on the action, but I’ll sum it up. In the year 2000, a mysterious band of scavengers known as the Harvesters invaded earth’s orbit and destroyed various satellites and space stations. Feeling threatened, the people of Earth retaliated only to underestimate the alien’s strength and be defeated. 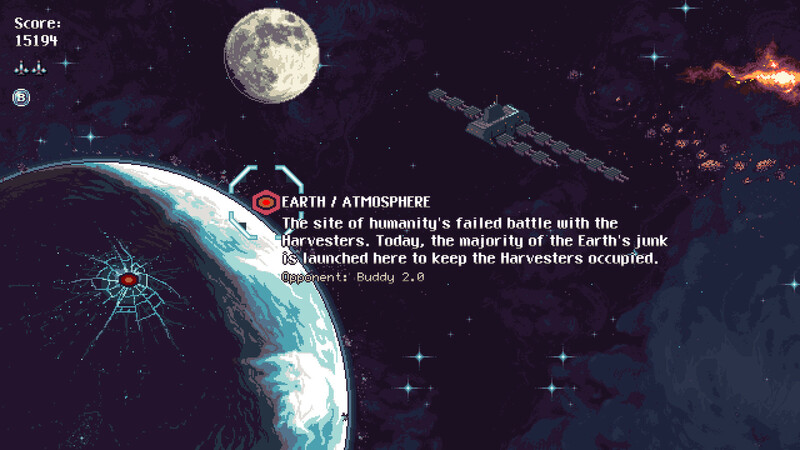 The Harvesters continue to drain the Earth’s resources for two decades until a contest, a battle royale if you will, is announced to find a new Hero that can defeat and destroy the source of the Harvesters and save Earth along with winning a huge cash prize. After reading the prologue you will be greeted by a beautifully animated intro filled with all sorts of glorious pixelated sprites. It’s really something to see it in motion and got me really excited to play the game. You can select six characters and each have their own reasons to be in the tournament which you will find out. Each fight plays as follows: the screen is split into two and you and your opponent each occupy half of the screen. You will both play through a stage and shoot enemies that come your way. You will be able to “Fight” each other by sending all sorts of projectiles and drones to the other side of the screen in an effort to overwhelm the other player. This is done by destroying enemies and building up a chain. The higher your chain, the more enemy drones you will send over to your opponent’s side of the screen and your attack gauge will increase. Enemies sent your way can be destroyed to increase your chain as well. If you hold Square up to a certain amount you can launch an additional special attack towards your opponent. If your attack gauge reaches 100%, press triangle to activate your Boss mode in which you transform into a giant ship or robot and are transferred over to the opponent’s side and can attack them directly. These are tricky to dodge and can easily end a match if the person you are playing against can’t keep up with the gunfire. That said, they can fight back by shooting at you and decreasing your health gauge. Should it run out, you will be turned back to normal and return to your side of the screen. If you or the opponent gets hit twice by any attack or stage hazard, they will lose the round. Of course while you are trying to find a way to win, your opponent will be doing the same thing to you, so you have to learn how to play defensively as well by paying attention to bullet patterns and using your bombs wisely to clear the screen. Occasionally a powerup will appear that will either repair your ship, give you an extra bomb or extend the duration of your chains. All three of them are useful and the fact that the powerups appear right in the line of fire adds a lot of strategy and tension to the matches. You have three lives or rather, can lose three rounds before you get a game over and continue. If you manage to get through about 7 stages, you will finish the game. Or did you? Each character has two endings and it all depends on your performance throughout arcade mode. Did you make it past stage 7 without continuing? If so, you will face one additional challenge and should you complete it you will be rewarded with that character’s true ending, otherwise you get a rather dark bad ending. While I can appreciate the incentive to clear this on one credit, I can see this being very frustrating to players if they are doing well only to mess up in one stage and be permanently screwed out of the ending. By the way you can continue during the bonus fight if you lose all your lives and still see the ending. The only requirement is clearing the stage seven boss without losing your three lives. I have not found any ways to get extends so I’m not sure if that’s even possible. A playthrough is fairly short at about 15-20 minutes on normal mode so it wouldn’t surprise me if those three lives are all you got. The final boss can be a bit annoying as the game kind of becomes a traditional shooter except that it is played in a wide resolution, meaning there is much more room for you to maneuver but that also means more of that space can and will be occupied by bullets and projectiles. It’s not the most difficult fight out there, but it can be a bit too much to manage at times. There are four difficulties and even on the easiest one, this fight can be more annoying than it really should. It also doesn’t help that your bombs do not get replenished between lives. Bombs and lives will carry over between stages so be sure to stock up for the final battle. No matter what ending you end up with you will be able to appreciate just how absolutely stunning the game looks. The pixel art is really detailed to drive home that sci-fi aesthetic and each stage is filled with all sorts of smooth parallax scrolling and multi tiered backgrounds. It gives the galactic environments so much personality and even better, the backgrounds change fairly frequently within the levels to really give each stage a truly epic feeling. I almost wish I could see this game running on a CRT as this style really reminds me of the great shooters of yesteryear. The soundtrack is also excellent, filled with high energy fast paced beats to get you in the mood. It sounds a lot like Capcom’s Q sound back during the CPS2 days. In other words if you enjoyed 90s style arcade music, this will be right up your alley. As for replay value, you can unlock various achievements however as of this writing I was unable to actually see them. It could be because this is a pre-release build and they are not active yet. There are also various cards and gear you can unlock as you play the game. The cards are mostly artwork that gives you some additional information on the characters and lore while the gear can be equipped on each character’s Loadout, which can be used in arcade or versus mode. You can equip various weapons and abilities to each character such as autobombing or item magnets. While these are nice, the game isn’t exactly very clear on how these are unlocked. I still don’t know what triggers them as the unlock notification seems to appear randomly while I played the game even when I lost. Also I noticed a weird bug when renaming a loadout, the Japanese keyboard appeared on screen despite me having English selected as my language. 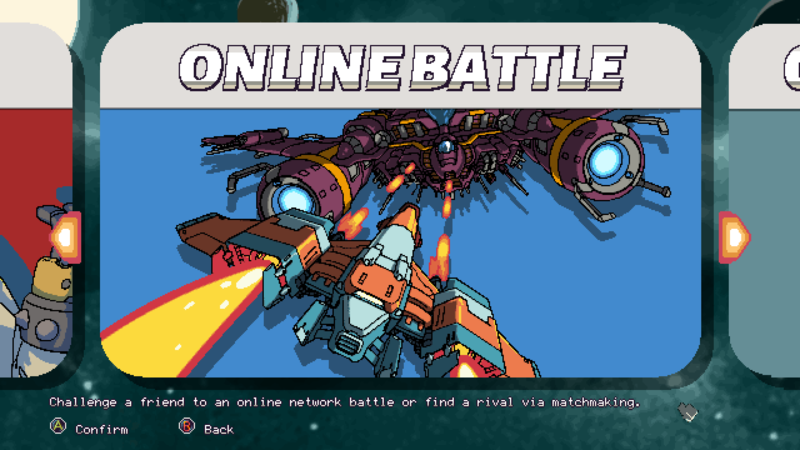 Rival Megagun’s versus mode is as you would expect. You can duke it out with another player or the CPU and this is probably the mode you will want to play the most with friends as it can be a lot of fun trying to see your buddies survive the insanity on screen as you two are both trying to outwit each other. There is also an online multiplayer and leaderboard however I was unable to connect to a match so I can’t comment on how stable the netcode is. Games like Twinkle Star Sprites occupied a space within the shooter genre that doesn’t get a whole lot of attention – the competitive shooter. Those games stood out because they dared to be different and put a weird spin on the genre and I always wondered why more developers didn’t try and expand on the ideas that game brought to the table. Rival Megagun seems to do just that. It took elements from it and delivers a package that is not only fun, but offers something you don’t often see. For $14.99, some may say that the game is lacking in content, but personally it was so much fun to play, I felt it worth the price of admission. This is the kind of game I can come back to or would want to show my friends because I can see us having a ton of fun playing.